Life on the Falkor requires a balance of being in the flow and keeping on your toes. I sketch in many breezy corners of the upper decks, observing science operations from all sorts of interesting angles. 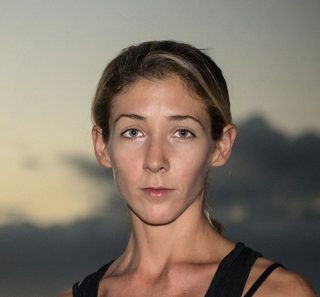 In the library, I have read an account of Jacques Cousteau, as well as former artist-at-sea Lucy Bellwood’s “Tall Ships.” I have also perused books about Vikings, phytoplankton, and oceanic life. Thanks to the Falkor crew, we had a wonderful 4th of July bar-b-que on the deck (minus the fireworks of course). Chief Engineer Miroslav Mirchev gave me a tour of the engine room – an impressive fusion of 1980s German engineering and millennial technologies. Our Lead Marine Technician, Leighton Rolley, introduced me to “Frank,” an inventive miniature CTD that was constructed during a previous expedition, but has been utilized repeatedly for our science operations. The experimental devices and set-ups of all the instrumentation on board reveal applied ingenuity – many have been specifically designed or modified by a member of the research team. Observing science in action provides a better understanding of the data, as well as inspiration for quick gesture drawings. Since I value and rely on the artistic process, I have focused my sketches on the daily processes of the researchers. I have rapidly filled the pages of my sketchbook over the past two weeks—this has been my most intensive drawing time in a while! 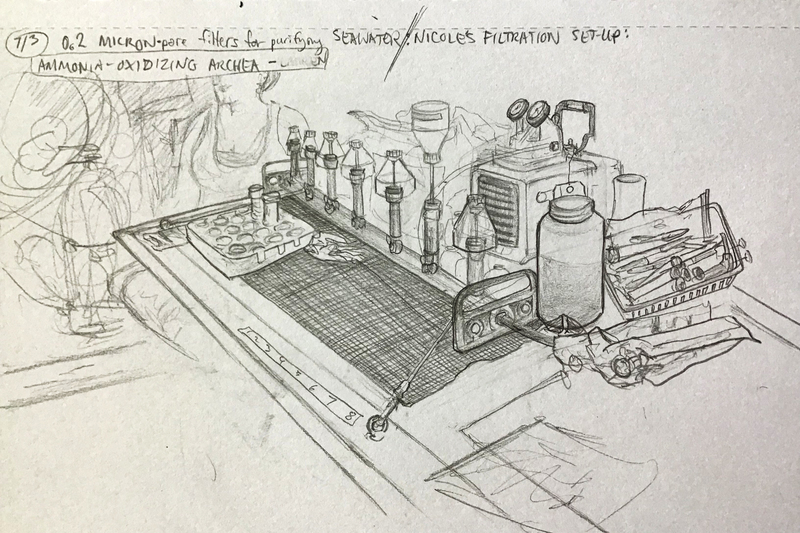 A small sketch pad is portable and enables me to keep up with all the science activity happening, therefore staying connected with my shipmates. I shadow, sketch, ask questions, and offer assistance when needed. My art endeavors flow steadily along. I was happy to bring to life the idea of a “microbial mural.” Inspired by the simple geometry of microorganisms, some of my previous art work, and slide arrangements of diatoms, I painted a square area (six feet by six feet) in the corridor next to the Wet Lab. 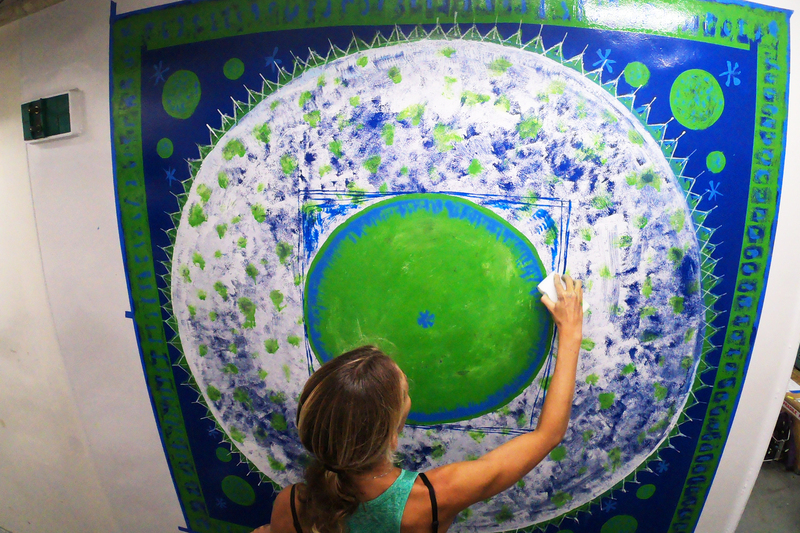 Jessica Orfe paints a mural in the hallway leading to the aft deck. ‘Diatomists’ create miniature artworks by obsessively positioning cells using a needle or similar tool while peering through a microscope. The designs, which resemble snowflakes, bring to mind marine snow (the biological debris that descends from the upper water levels to the ocean floor), which is integral in microbial nutrient cycles. Symmetrical arrangements reflect the nature of the cells, and these mandalas feel like a natural response to the mysterious nature of that which we cannot see but strive to understand. In my remaining time on the ship, I am looking forward to developing a few other artistic ideas, including painting with water from the sampling stations and creating a microbe coloring book. 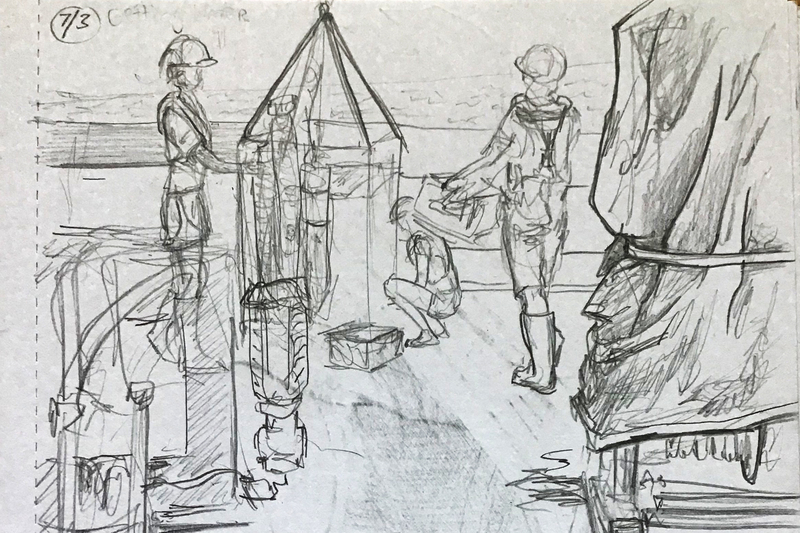 Sketch of water collection on the aft deck.